And instead of doing Thy typical team-by-team review, especially since that DON'T excite me right now, as how dare I say it but, the series seems somewhat Ah-shambles to Mwah - with the loss of another three Fulltime entries, regardless of A-L-L the Rainbows 'N Bunnies Sunshine PR Speak we'll be hearing Ad Nausea until Memorial Day weekend, when the bulk of the Media Speak perpetually dies down. As surely nary ah Peep will be heard 'bout some new fangled A-L-L Ovals Open Wheel Racing series beginning two decades ago when its founder implemented that infamous 25-8 rule for some track in Indianapolis! Twenty-four hours before Thy Night of thee Long Knifes; OOPS! Wrong story; Uhm? Night before J. Douglas Bowles and Company went Barkin' at Duh Moon, (Feb 18th) in celebration of 100-days 'til Mother Speedway's B-I-G' Tuh-doo, my very unscientific count came up with only 26 Bonafied entries for the Indy 500 race, with Chevy & Honda tied at 13-apiece. Although I didn't include Lazier Partners, whilst certainly Townsend Bell will land a ride again somewheres', right? But still seven cars shy 100-days out seems somewhat disconcerting, eh? And for the rest of the year, when we're not Awash in Mother Speedway Hoopla, since after all there are other races besides the Indianapolis 500, right Starship HC? Since for humour I looked up the '86 season and I-T consisted of 17 true Stand-alone races, beginning on April 6th at Phoenix International Raceway and finishing on November 9th at Miami's Tami Ami Park. Plus one non-points event, presumably on Thy Gold Coast at Surfers Paradise Mates! Thus doing my now yearly ritual of creating my personal "Spotter's Guide," which is pretty funny since I cannot S-E-E a blinkin' car anymore; SIGH! I came up with the following car count several hours before those gathering upon Thy Bricks at Midnight! Yet, as always, AIN'T Official. There's a whopping ten teams on the Grid with six being Hondre' powered and the remaining four wearing Bowties. HOLY SHRINKING CAR COUNT BATMAN! Naturally, out of the eleven Fulltime Honda powered entries slated for this year, Andretti Autosport is the Big Kuhoona' once again, with RHR', nee Ryan Hunter-reay scoring multiple wins last year, along with Carlos Munoz's maiden IndyCar win at a sopping Belle Isle. Yet Graham Rahal in his Father's single car band "O Merry men were actually Honda's best team with Graham contending for the championship. As never in my wildest dreams did I ever think I'd find myself rootin' for the resuscitated 'Graminator; YIKES! While the only other Hondre' winner was thee Mayor 'O Hinchtown doing a most crafty Rain dance in Nawlins en route to an improbable victory before that horrifically scary season ending crash at Mother Speedway! On the Chevrolet side, once again we find the series two Heaviest Hitters, with Thy Cheepster', nee Chip Ganassi going Mano e Mano versus his longtime Sparring Pardner 'El Capitano, aka Roger Penske. As both premiere organizations will field four cars apiece. The other two Bowtie runners seem to be mere shells of themselves, both sporting only single car entries Fulltime, although the newly reformed Ed Carpenter Racing's Josef Newgarden enjoyed his Breakout season last year by scoring his first two IndyCar victories - whilst KV XP Calladrociouses le 'Hamburgular, nee SeaBass, aka Sebastain Bourdais scored a fantastic win at Milwaukee. And know I'm soundin' like a broken record but; where are A-L-L of the vaunted MRTI Indy Lights graduates? Namely series champions? As the names Wade Cunningham, Jay Howard, Alex Lloyd, Rafael Matos, J.K. Vernay, J.R. Hildebrand, Tristan Vautier, Sage Karam and Gaby Chaves are littered about! With just over three weeks before St Petersburg, only the 2011 Indy Lights champion Josef Newgarden would be racing in Thy B-I-G' CARZ Fulltime! For humour, beginning with James Hinchcliffe's rookie season in Indy Cars, five years ago - having finished runner-up in Indy Lights in 2010, I decided to take a gander at how many drivers who've graduated from Lights are still racing, and more importantly have stuck around to participate in this year's IndyCar season! Charlie Kimball and Takuma Sato were part of Hinch's 2011 rookie class, albeit Taku-san' was hardly a rookie, having joined A.J. Foyt Enterprises after multiple years in Formula 1. As Sato's rookie status was pretty funny, akin to Rubino', aka Rubens Barrichello, Formula 1's All-time starts leader with 322 who became an IndyCar rookie the following year at KV Racing Technology alongside Good Buddy TK' Follow-your-Schnoz! Kanaan and E.J. "What? Me Worry!" Viso. Twenty-twelve saw Josef Newgarden and Simon Pagenaud moving up to IndyCar, albeit Pagenaud came from the American Le Mans Series and Champ Car ladder previously. Jack Hawksworth graduated from Lights in 2014 alongside a most intriguing rookie named Mikhail Aleshin, winner of the 2010 Renault Formula 3.5 Series, one of Formula 1's major feeder series. While 2013 Indy 500 Rookie Of the Year Carlos Munoz graduated to a Fulltime ride with his previous Indy Lights employer Andretti Autosport. As its interesting how none of last year's IndyCar rookies, including Gabby Chaves are in the field, whilst Conor Daly, another Sam Schmidt Lights graduate, class of 2011 will race against two former Formula 1 Hot Schues, Max Chilton, who I've already forgotten drove the bulk of last year's Lights campaign for Carlin. Reigning Lights champion Spencer Pigot's only got a confirmed three-race deal, which hopefully he'll shine in his maiden race at St Pete before joining another Lights Alumni, Mathew Brabham, who contested the full 2014 Lights season followed by a One-off outing at St Pete in 2015 before disappearing off to Formula E. As the two novices will run the Indianapolis Double in May. And then there's this other F1 Chap named Rossi. Having Ah-waited news on whether or not Alexander Rossi would grace us with his presence at the newly formed AHA #98 concern? Alas, with baited breaths, who'll fill Dale Coyne's vacant second seat? As I'd enjoy seeing Jack Harvey alongside Conor Daly, although Curty' Cavin seems to think it'll be Luca Filippi getting the nod. As presumably this year's series champion will once again come from one of the Top-3 teams; ergo Ganassi, Penske or Andretti? Although the latter will surely hinge upon how well Honda's rejuvenated Aerokit performs, whilst many will be curious to see if Graham Rahal's form continues and can Marco Andretti win a race? Although it seems reigning four-time champion Scott Dixon will be fighting an uphill battle vs. Team Penske's gauntlet, although I'm guessing the 40 Somme-thuns' will faulter once again leaving Dixon to fend off Will Power and Simon Pagenaud, with Hunter-Reay being the lead Contendah' at "Double A." But if the Hondre' AFX Aurora Body-by-Mennen Aerokits prevail being closer to the Bowties, then I'll pick the Rooskie', aka Mikhail Aleshin to take a surprise win somewheres' on a Twisty course, which will put pressure upon Thy Mayor 'O Hinchtown to return the favour. While you've gotta believe that Newgarden will make another appearance on the Podium's top step, where SeaBass will try punting him from. But careful Monsieur Bourdais, DON'T drop that trophy; Hooah! And lastly, I'm really looking forward to the Rookie Of the Year )ROY) Scrum of Conor Daly in the Shoebox DCR entry vs. ex-F1 Pilote' Max Chilton at the resplendent Ganassi stable 'O Thoroughbreds. Which I'd truly LUV' seeing Conor prevail over Chilton and America's latest torpedoed F1 hopeful Alexander Rossi! 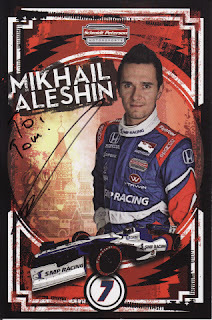 As its pretty scary to Mwah, that the only two drivers who've got me truly "JAZZED" this year three weeks prior to St Pete are Conor Daly and Mikhail Aleshin! While I'm hopeful Hinchcliffe and Newgarden can continue their upward trajectories, and now there's this Rossi Cat! Happy St Patty's Day wishes to Y'all! Is Ed Carpenter really that Desperate?